Refresh your skin with Dr Bronner's Peppermint Hand & Body Lotion! 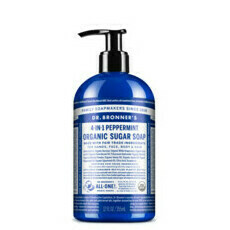 This minty fresh formulation is made from beautiful fair traded, organic ingredients including Hemp Seed Oil, Jojoba Oil and Peppermint to restore moisture to skin. Suitable for all skin types, Peppermint has long been praised for its ability to help relieve stress, making this lotion ideal for keeping by the sink or shower so it can be quickly added to the hands and body after washing. Just a few squirts will cover the whole body and absorb quickly into skin. Made in the USA. Certified Vegan, Certified Cruelty Free. 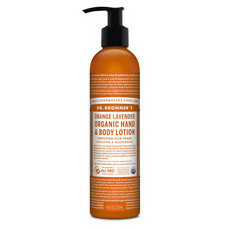 Certified Fair Trade, Organic & Sustainable. Avocado Oil, Coconut Oil, Jojoba Oil, Peppermint. Gentle enough to be used anywhere — hands, face or body. 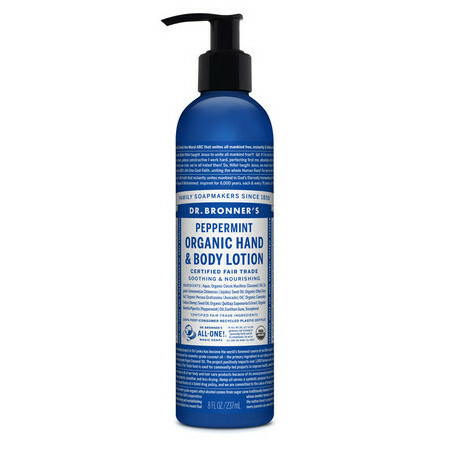 This lotion is highly emollient, so start with a small amount. Has a lovely peppermint smell but when applied it's very thin and has almost a sticky, drying feel :( Wouldn't buy again. This is so great on the feet - soothing, cooling, absorbs well.